This four-year programme offers an additional year on top of the Chemical Physics BSc, providing scope for greater in-depth study in advanced topics such as quantum mechanics and computational chemistry. It is ideal if you intend to pursue a science-based career. Chemistry, Mathematics and Physics required. A total of 18 points in three higher level subjects including Chemistry, Mathematics and Physics, with no score below 5. Successful completion of the WBQ Advanced Skills Challenge Certificate plus 2 GCE A-Levels at grades AAA, see A Level information for subject requirements. The department has a rich history at the intersection of chemistry and physics, and is home to UCL's Centre for Computational Chemistry and the Centre for Cosmic Chemistry and Physics. Chemical Physics is offered either as a three-year BSc programme or as a four-year MSci. Modules are identical for the first two years of study, so you can defer which to opt for until the end of your second year. We advise you, however, to select the four-year MSci programme initially as this gives you the most control over you plans. 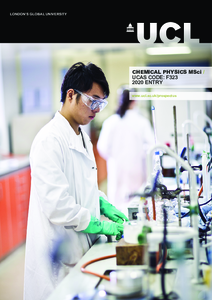 Although the Chemical Physics MSci is based on core chemistry modules, there is more scope to develop skills in physics and theoretical aspects of chemistry, and either inorganic chemistry or organic chemistry is omitted after the first year in favour of mathematics, physics and specialist chemical physics modules. In year one all modules are compulsory, and in year two you will take a combination of compulsory modules together with a number of optional Chemistry modules and further modules from outside the department. In the third year you take further compulsory and optional modules including a core literature project and extended laboratory classes. In the final year of the MSci, you will undertake a chemical research project and optional modules, allowing you to specialise in the chemistry field of your choice. You will select 1.0 credit of either inorganic chemistry or organic chemistry options, plus 0.5 credits from further Physics or Mathematics options. Modules usually involve at least two methods of assessment; coursework (problem sheets, essays or poster presentations), an examination, or lab classes. Feedback, such as face-to-face marking in laboratories, is always provided. Your final-year project will be assessed through a written report, a presentation and an oral examination. Detailed course descriptions are available on the department website: Chemical Physics MSci.